Trying to find a recipe my Oma made when I was little. She called the bread Landbrot, and the other was Funfkornbrot. Would love to make this, but her recipes were never wrote down. Hope some one out there can help! I am afraid, it won't be easy to find a recipe that tastes the same like the bread your Oma made. With more than 300 different kinds of German bread varieties, a Landbrot is slightly different in German regions. Like Bauernbrot, Landbrot is a hearty rye/wheat mix bread with variable fractions of rye and wheat flour. 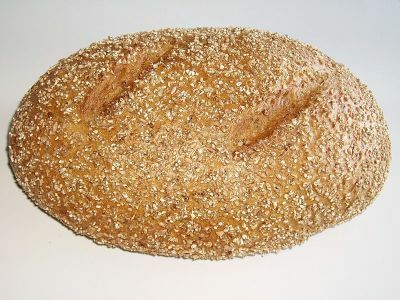 The crust is often dark brown, but the bread is not as dark inside. The top photo is what we call a Roggenmischbrot (rye/wheat mix), Landbrot or Bauernbrot. Fünfkornbrot or Mehrkornbrot is bread that is baked with different types of flour, wheat, rye, barley, spelt. Sesame, sunflower and/or pumpkin seeds are added additionally. Although I love to bake, I have never made bread myself, so I won't offer you a recipe that is not tested. Hopefully, other readers add their German bread recipes and you'll find one that comes close to your Oma's bread. Same as Landbrot, you can buy it there. http://backereidohring.com/2.html is what you are looking for. Vicki: do not show me only pictures of good German bread, tell me where I can buy it.